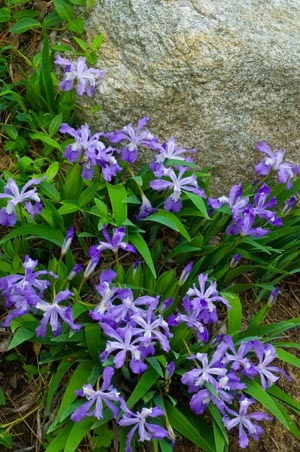 Spring Beauties in your Asheville Landscape | Terri Long Landscape Design, Inc.
Spring is my favorite time of the year. I’m always excited to see the new growth emerging after the winter’s rest and the cheerful colors of blooms and the lime green of new foliage. There’s a sense of new possibilities and anticipation in the air. What a great time to start something new- hence, the beginning of a blog by Terri Long Landscape Design. I hope that you find it interesting and useful. I look forward to your comments and questions. Spring bulbs are one of the first harbingers of spring. Some even bloom in late winter, so with a variety of bulbs you can introduce flowers into your landscape early and for a long time. 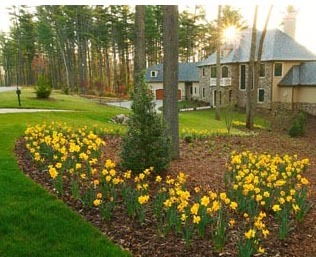 You can create or emphasize curving lines with large sweeps of flowering bulbs. Mass plantings of bulbs are a great way to add fast color to a young landscape and also provide a source for cut flowers. We all know daffodils, tulips, crocus and grape hyacinths. Daffodils and crocus are pest resistant, so you don’t have to worry about them being damaged by squirrels, chipmunks, voles and other critters. As some of you know, I moved into a 70s neighborhood in Asheville last year. I’ve been delighted to see the spring bulbs that were planted by previous homeowners appear and bloom. Although tulips are unreliable and short lived in the south, I’m happy to see buds emerging from the foliage and am eagerly awaiting the flowers to mature and bloom. I don’t even mind the grape hyacinths and violets in my lawn, since they add purple into a sea of green and really shouldn’t interfere with mowing. They’re not for those who like a perfect lawn, since the grape hyacinths seed themselves with abandon, even from well-maintained perennial beds. Other bulbs that you may not have considered are Squill (Scilla), with beautiful blue or white flowers which are deer resistant, and Snowdrop (Galanthus), a white, bell shaped flower that combines nicely with Hellebores. Both of these are good for naturalizing. For those bulbs that are prone to critter damage, you can plant them in wire cages or, better yet, plant them in PermaTill-Vole Bloc, which is made from expanded natural slate by a North Carolina company. 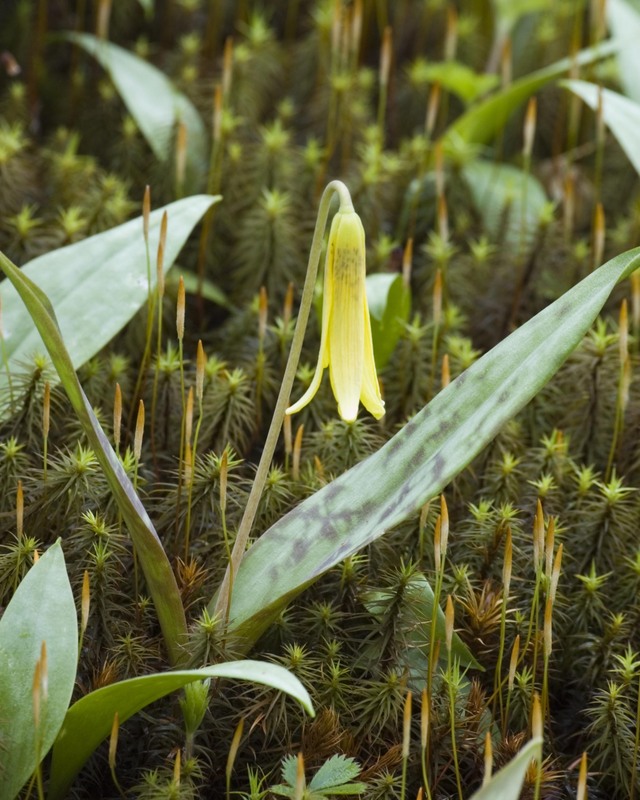 For native plants, look at Trout Lily and Spring Beauty, which are corms, and Crested Dwarf Iris, which are rhizomes rather than bulbs. Trout Lily and Spring Beauty are spring ephemerals, so they are visible for only a short time. The foliage of the Crested Dwarf Iris will last through the summer, except in very dry summer conditions. These natives look great in woodland and rock gardens. The National Native Azalea Repository at the North Carolina Arboretum (www.ncarboretum.org) is an excellent place to see masses of trout lilies in the spring. Their mottled foliage resembles trout (not surprising that they are called trout lilies). Their small yellow flowers are a good reason to bend down to get a better look at their flowers and foliage, slow down and get in touch with nature. You can see Spring Beauties at The Botanical Gardens of Asheville (www.ashevillebotanicalgardens.org), along with a multitude of common and rare native plants of our region. Now is an excellent time to look at your landscape and see where you would like to add early spring color with bulbs. Planting bulbs is also an easy way to improve your curb appeal if you are considering putting your house on the market next spring. Take notes so that you’ll know where to plant your spring bulbs in October. Or better yet, contact me to evaluate your landscape, make suggestions, and we’ll come back and plant them for you in October. You’ll have more time to enjoy the wonders of spring and have something new to look forward to next spring. This entry was posted in Spring Landscapes and tagged APLD, Asheville Botanical Gardens, Asheville Landscapes, Asheville NC, bulbs, design, landscape, Landscaping, native plants, NC Arboretum, North Carolina, spring, spring bulbs on April 12, 2011 by Terri Long. Thank you for this breath of spring- informative, inspiring, and beautiful! Working with nature is healing of all of us!